After a long day, in the middle of a difficult day, before you go to sleep, or before you start your day, it is an excellent idea to put aside ten-twenty minutes to heal your nerves and ease your mind. 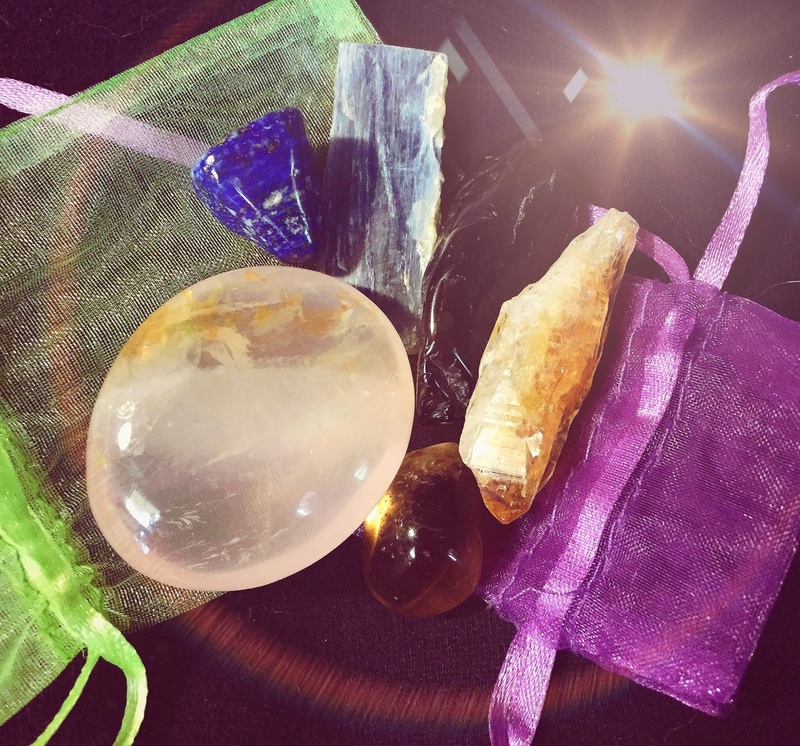 Whether it's stress, migraines, a racing heartbeat, or worried thoughts - there are crystals that can help you overcome what you are feeling. When you lose your relaxed state, you lose your control. When you lose your control, you give up your power and strength to ego. Sometimes it's hard not to lose your control and your peace of mind. To reenter the state of relaxation and control, however, is easy. I was able to heal my migraines with this Lapis Lazuli stone. Amazing! Amethyst, Sodalite, and Lapis Lazuli are my favorite crystals to use for headaches and migraines. 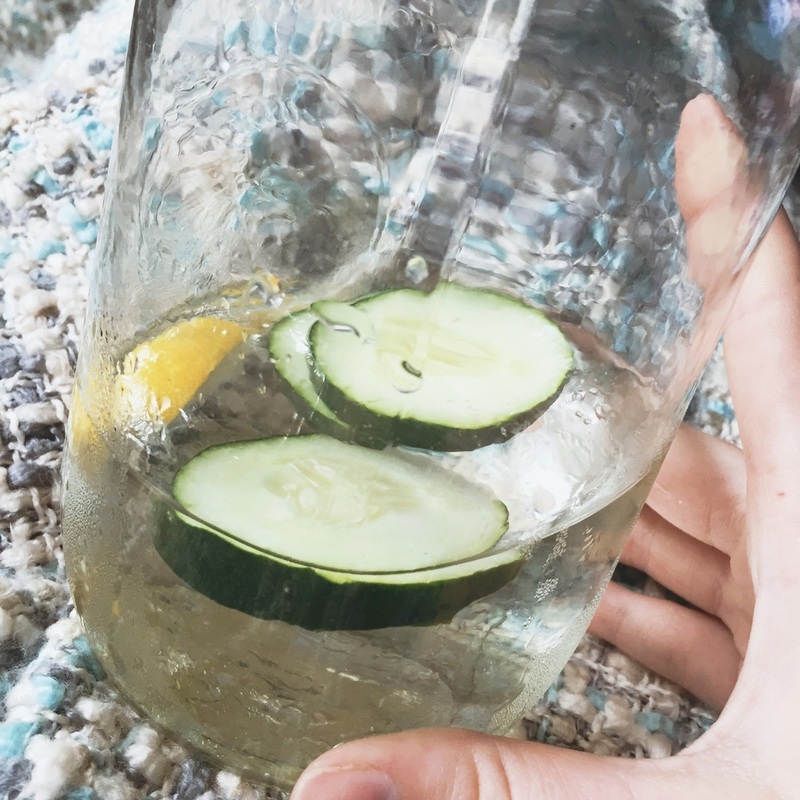 There are two quick ways to relieve headaches using one of these three crystals. If you are able to lie down for ten minutes, simply lay comfortably with your arms flat to your sides. 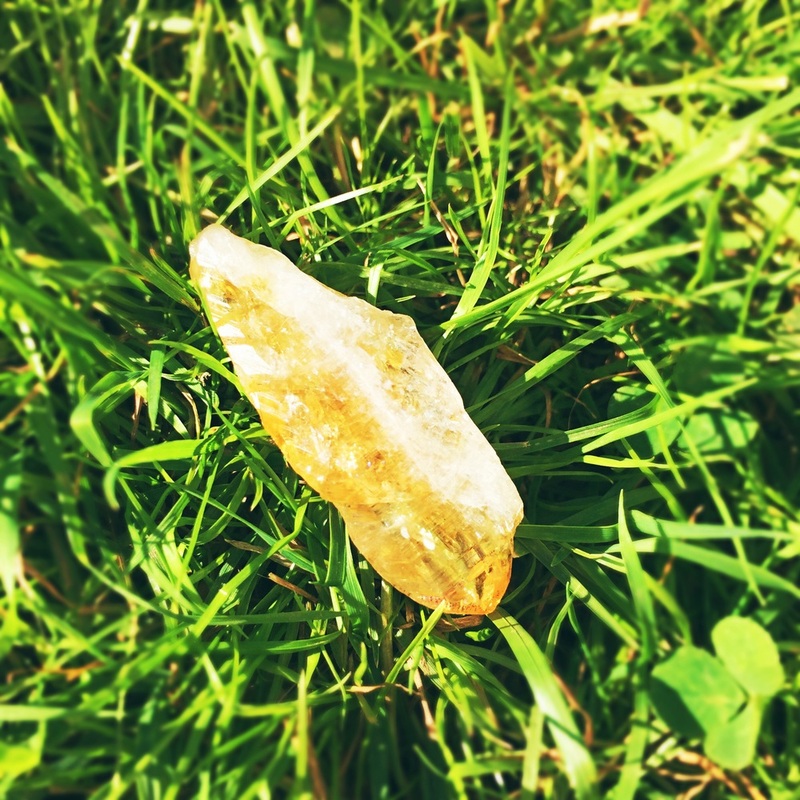 Place the crystal of your choice on your forehead (or on your third eye chakra) or hold it in your hands. Close your eyes and take deep breaths - in through your nose, out through your mouth. Your focus should remain on your breathing and on the warm, vibrating energy of the crystal's contact with your skin. Inhale positive energy, exhale negativity. Inhale peace, exhale stress and worry. Inhale serenity, exhale pain. If you are unable to lie down, simply sit with straight posture and do the same. When the feeling that you are losing all control strikes, you are in dire need of grounding. Some other symptoms include feeling tired or drained, overstimulated and jittery, feeling floaty, misplacing things or being clumsy, feeling like you are stuck in an out of body experience, or not being able to keep track of important things or conversations. Some excellent crystals to use to solve this problem are Smokey Quartz, Black Tourmaline, or Kyanite. Feeling like you are not grounded comes from your root and earth star chakras. Your root chakra is located at the base of your spine and your earth star chakras are located at your feet. 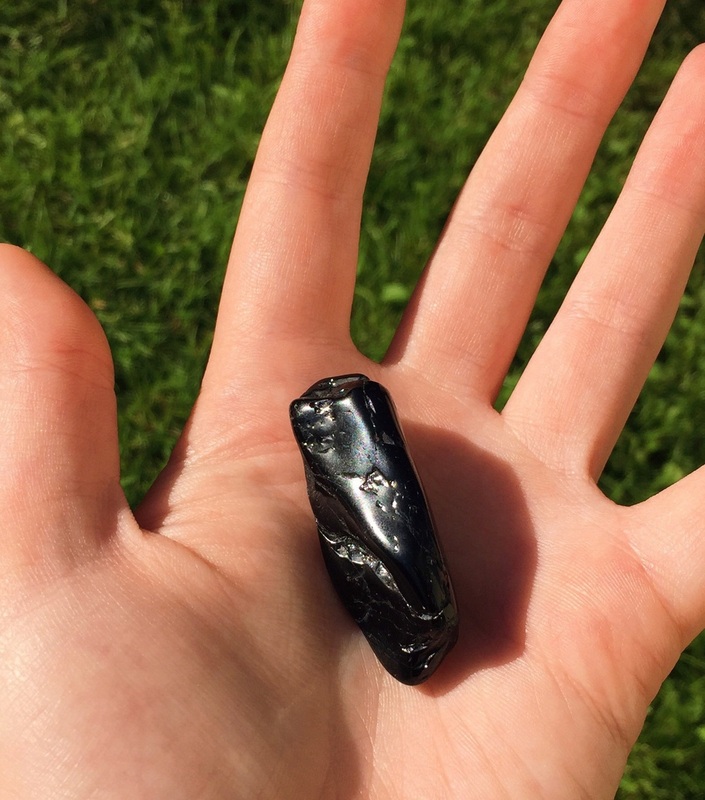 The best way to ground yourself and gain back your control is to stand barefoot - especially outside in the grass if you are able to - and hold the smokey quartz in your hand. The way you should be standing is known as "Tadasana" for yogi's. This pose is powerful to practice because it is a helpful way to regain power within itself. You stand tall with your feet apart and arms next to you with your palms facing outward. Wear or hold the crystal you are using. This will center you spiritually and ground you with the Earth. If you are unable to go outside or stand, you can sit upright with your feet touching the floor and take deep breaths holding the crystal you are using. Imagine what is below you - the floor, the grass, the dirt, the earth, all the way deep down to Earth's oldest layers. Now picture the energy from those oldest layers all the way up sending life and vitality all the way up from your toes, through your body, and beaming out of your crown chakra into the sky and then to the galaxy. You are one with the Earth. You are safe. Everything you need is provided for you. Labradorite (left) and Lepidolite (right) are great crystals for restoring inner peace. The colorful sheen Labradorite offers is enough to distract your mind from all frustration. Frustration can be painful - when everything around you is not going as you wish it would. This type of feeling can be caused by people, work, life at home, etc. Some great crystals to use for this are labradorite, moonstone, and lepidolite. Labradorite and Moonstone are especially good for when people bring you down. These are two crystals that protect against energy vampires and will raise you to your higher consciousness - allowing only light and wisdom in and out. Lepidolite is better for stressful situations you may be faced with because it eases transitions. 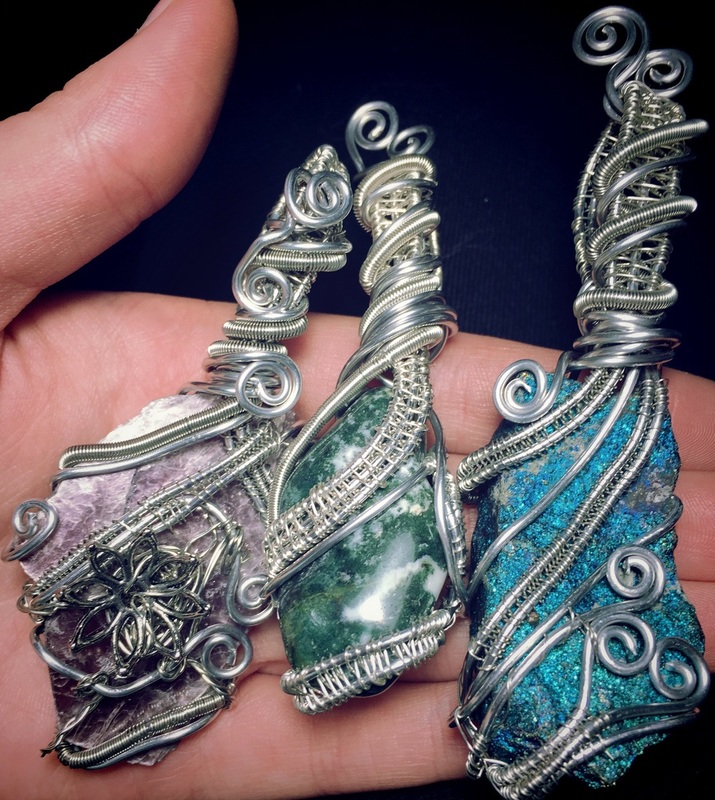 All three of these crystals are excellent stress relievers. The best way to use them is to sit or lie down holding them in your hand. Breathe deeply. Think of what is stressing you out. Channel this into the crystal you are holding and allow the crystal to channel it's energies into you. Remind yourself that other people and events are beyond your control and you should not allow those types of things to frustrate you. Affirm that everything has a way of working itself out. Allow the light of the piece of Earth you are holding to wash away your worries and restore you with the positive, calm energy you need. Here I hold two Uruguayan Amethysts. The deep purple crystals put me in such a trance. Blue Calcite, Carnelian, Amethyst, Rose Quartz, Blue Lace Agate, and Aquamarine are the best crystals to use to relax during this kind of trouble. Worry and panic originate in the mind, and can easily be fixed by a change in thought. However, it is very difficult to retrieve thoughts once they slip into the egoic realm of negativity. After the mind is dominated by negativity, other parts of the body can very easily be altered and brought into a terrible state. Blue Calcite can specifically be used to relax the mind and the heart rate. Carnelian is best used to calm scattered thoughts or brain chatter that is not benefiting you and to keep your mind focused on proper action that needs to be taken. Amethyst and Rose Quartz can be used to relieve the mind of negative, worried thoughts and bring your heart and spirit back to a peaceful state. Blue Lace Agate and Aquamarine can be used to relax the mind and replace negative thoughts with positive ones. When you realize you are beginning to worry and panic, and it is too late to create a positive reality for yourself - try this technique. No matter where you are or what you are doing, hold one of the crystals listed above in your hand and focus on it. For this kind of problem, it is not necessary to be seated, lying down, or standing - though it may help to physically be relaxed. Close your eyes and bring your attention to the crystal in your hands. Breathe in and out deeply as you feel the crystal vibrate in your hands. Feel the warmth of the crystal spread through your hands. Let the energy of the crystal wipe away any worry in you heart or in your mind. Remind yourself that you are safe, happy, and healthy. The color contrast in the pendant is so mesmerizing! Today I am wearing the new Blue Chalcedony pendant. I chose this pendant today knowing the properties it carries. I needed something for my throat chakra today. I woke up in a very bad mood and with the way my day was going, I knew it would cause me to say something I would later regret. Even though I try to let things go that cause me discomfort or anger, it is easy to dwell on situations and build up unneeded anger and worry. Blue Chalcedony is a great stone for relieving anger, worry, and fear. Not only does it relieve the negative thoughts, but it is a great stone for bringing one into a state of optimism and trust. 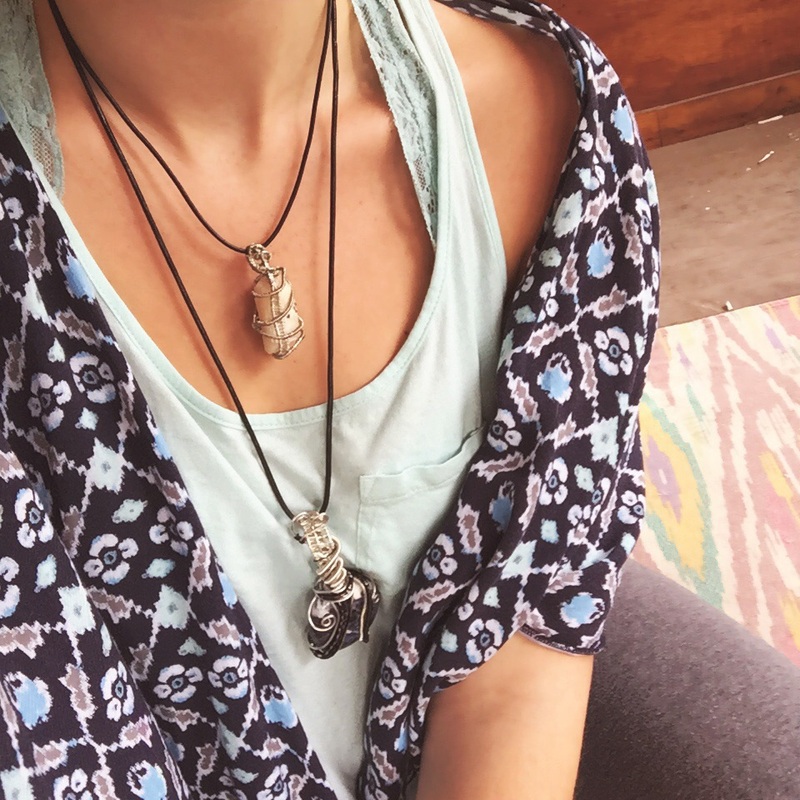 The throat chakra is balanced by wearing this stone so it allows for the expression of what we truly feel. Bringing all these elements together allows for peaceful, optimistic expression of thoughts, words, and actions - eliminating any concealed anger, fear, worry, doubt, etc. Throughout the day I watched my attitude change. It went from being annoyed that I had to clean my messy apartment, to being excited to have a fresh, clean space; being frustrated with the amount of work I had to do, to feeling excited to make some new pieces; feeling irritated and annoyed with the people around me, to feeling talkative and relaxed around the friends I see. My negative outlook on today turned around so quickly! I appreciate the optimism that this pendant brought me today. I am a firm believer in the law of attraction. The law of attraction is the theory that what you think is what you attract - so focusing on the positive will bring good things and focusing on the negative will bring the bad. For example: you're getting ready for the day and you are running late. You're speeding to work, worrying about getting pulled over - and you hear sirens. Just as you think your day could not get any worse - you spill coffee all over your new shirt. All those moments you put in worrying, the universe heard your words. You attracted more negative to happen. Instead of thinking about how your day couldn't get worse, think about how it could get better. I am sure that without the optimistic energies this pendant brought me, my day would have went downhill, fast. Instead, I was brought optimism and because I was brought optimism I had the loveliest day. Thank you Blue Chalcedony! !